When you quit your job after 21 years, the first thing you want to do is get away and have fun. That’s why the morning after my last day as a middle school principal, we were in the car headed south to the Port of Galveston for our first-ever Carnival Cruise. Ready for the sail away party on the Carnival Valor. While we are big fans of cruising, we had never cruised with Carnival, and we looked forward to seeing what it was like to sail on that line. They call their fleet “fun ships” and let me assure you, they are dead-serious when it comes to guests having fun. 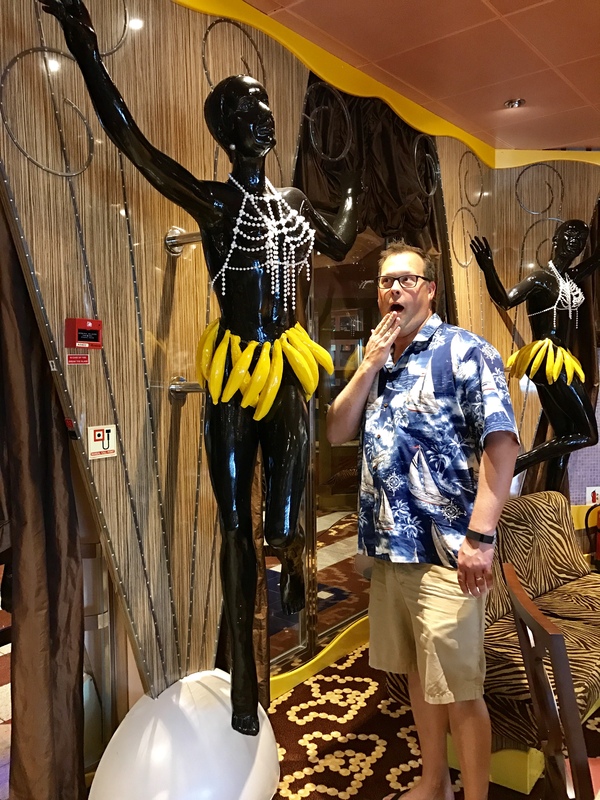 Here are five things that made our first-ever Carnival Cruise so much fun! No matter the cruise line, every ship throws a sail-away party to celebrate the start of a new cruise, but Carnival’s was on a different level. 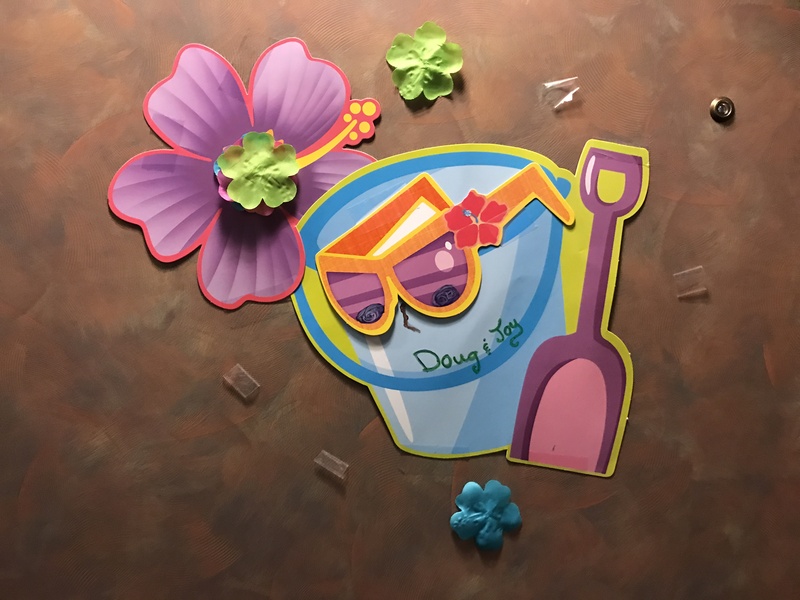 Led by the high-energy cruise director and other ship staff, passengers danced to great music while cups overflowed and laughter filled the air. Carnival works hard to remind passengers that they are on vacation and it’s time to let go and have a little fun, and they set the tone before the ship is even out of port. The decks were packed with people ready to have some fun at the sail away party on the Carnival Valor. Cruises are well-known for having plentiful, good food and Carnival is no different. 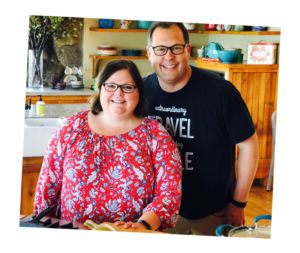 We loved some of the creative things they did to make every food experience fun. They offered a Dr. Seuss brunch at sea in which they served green eggs and ham, as well as french toast coated with favorite breakfast cereals. 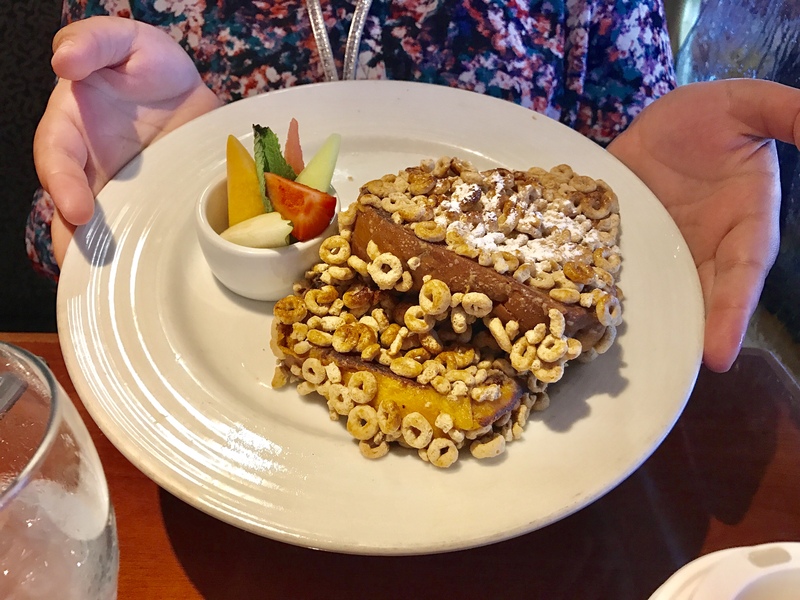 Funnest French toast crusted with a choice of Honey Nut Cheerios, Raisin Bran, Fruit Loops or Frosted Flakes. Brunch isn’t the only special meal aboard. The main dining room even offered a chocolate buffet one day. 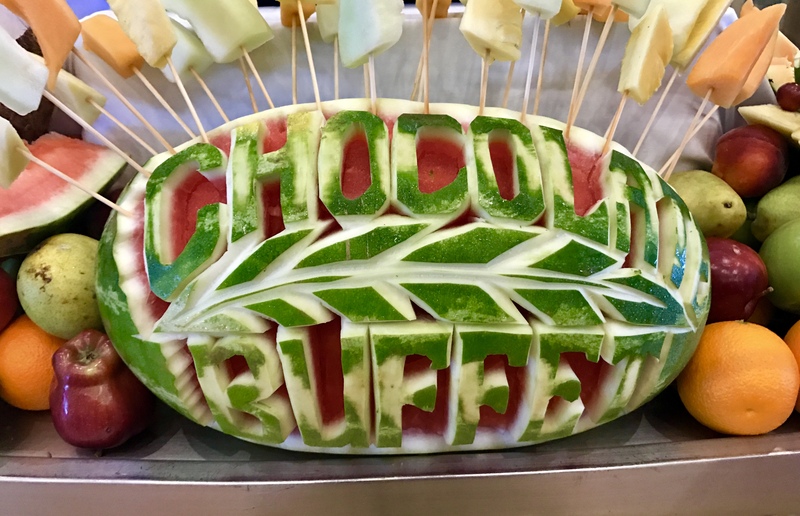 The chocolate bar on the Carnival Valor included beautifully carved watermelons with fresh fruit for dipping in a chocolate fountain. 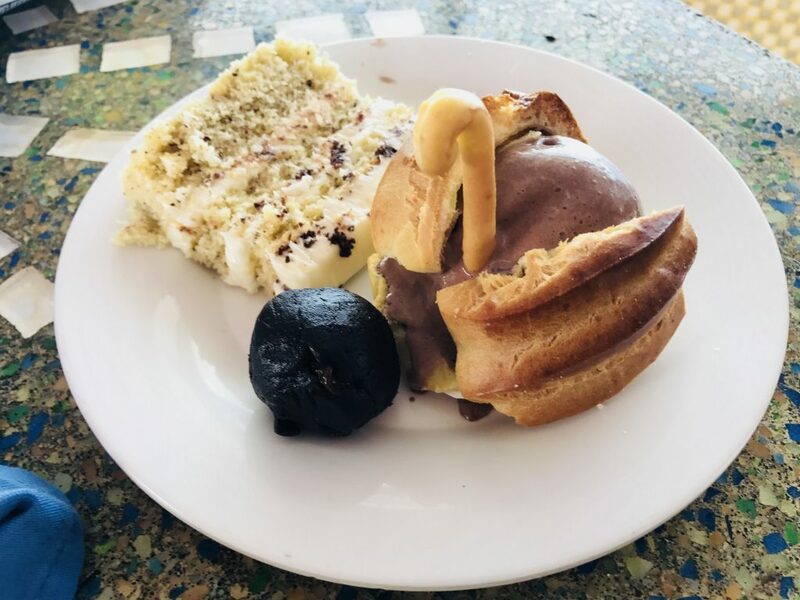 Our favorites from the chocolate extravaganza included the chocolate swans, chocolate rum balls, and pear chocolate cake. Another great option on the ship is an over-the-top hamburger from Guy’s Burger Joint, the on-board burger bar. 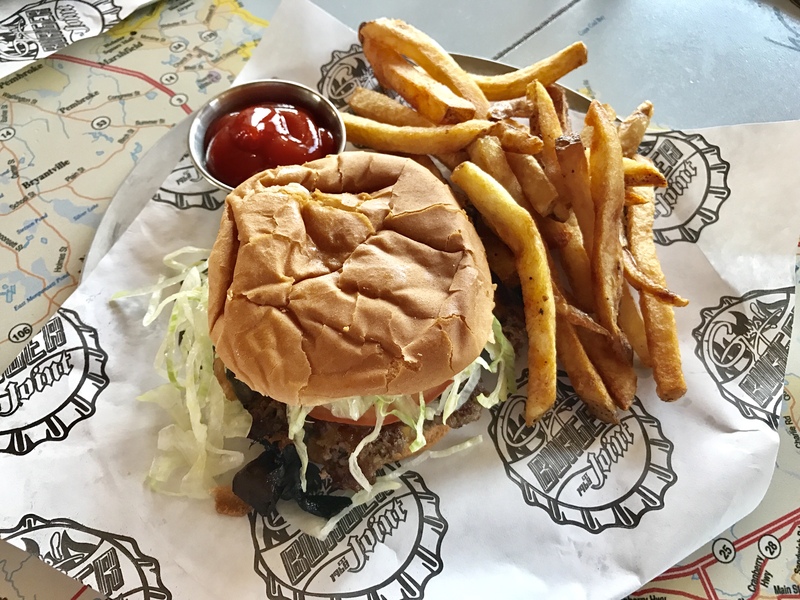 Carnival teamed up with Food Network personality and chef Guy Fieri to bring guests the “best burger at sea.” Piled high with your choice of toppings and served with a side of hand-cut fries, this burger is guaranteed to please. Made to order burgers at Guy’s Burger Joint on the Carnival Valor. The main dining room serves up classic food every night in a light, fun atmosphere, unlike anything we’ve seen on other cruise lines. I’m always impressed seeing how quickly cruise ships can serve quality food to so many hundreds of people, but our favorite part of dinner on board came near the end of the meal when Pharrell Williams’ “Happy” began playing over the load speakers and all the servers started dancing on the serving stands. Definitely added a new fun factor to fine dining. 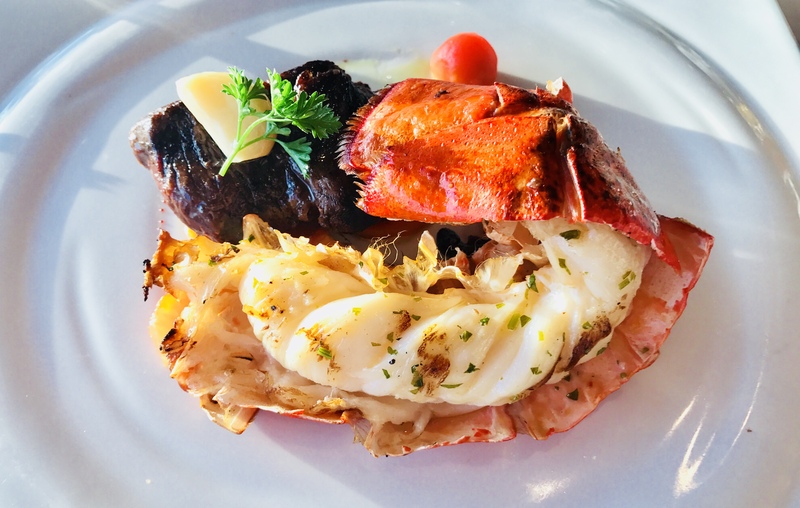 Finally, you can take things up a notch and dine in the Steakhouse, a restaurant offering gourmet food with exceptional service. For a modest additional fee, you can dine here and get a meal that on land could easily cost more than $200. My steak was amazing and Ann loved her surf-and-turf meal. Carnival works hard to offer a number of activities that cater to a variety of interests so that no one on board is, well, bored. Sure, you can sit, relax by the pool, sip a cocktail, and do nothing if you’d like. 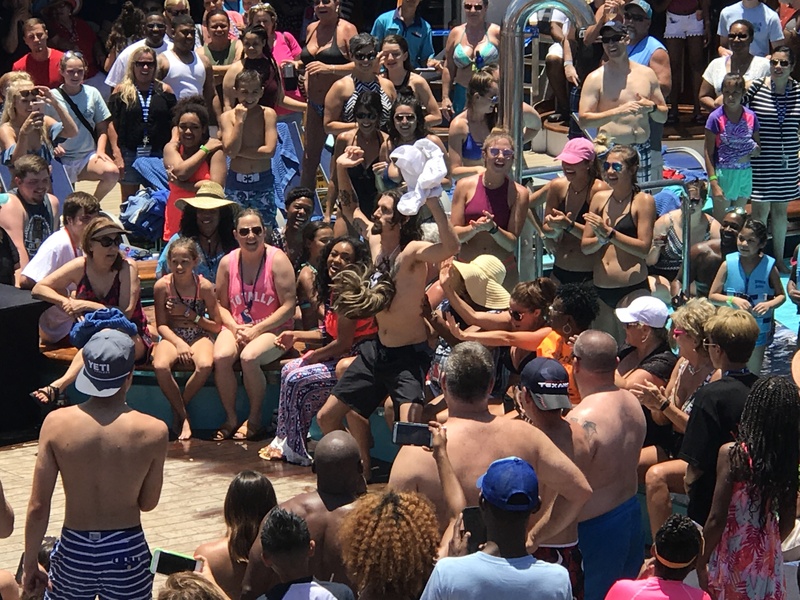 But if you want to have a lot of fun, the ship has plenty of it, including a beer pong tournament, hairy chest contest, dance lessons, and Congo train just to name a few. 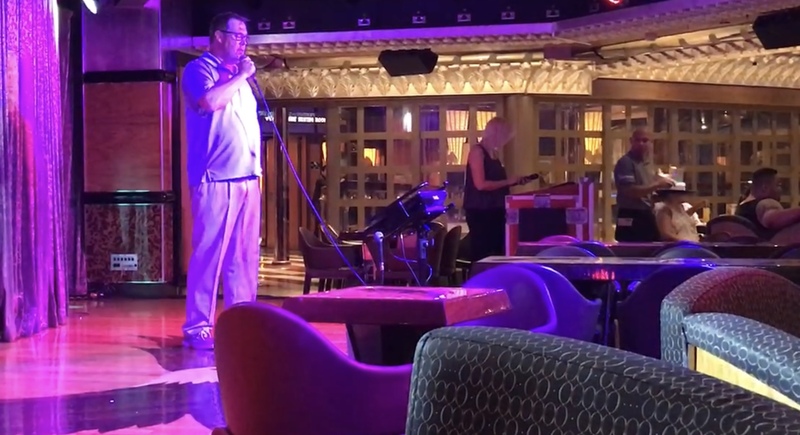 Steve sang Garth Brooks’ “Friends in Low Places” during Karaoke one night on the Carnival Valor. All the entertainment isn’t found at a Karaoke bar, though. The ship also has a large theater suitable for impressive major production shows with great singers, dancers, actors, comedians, and magicians. 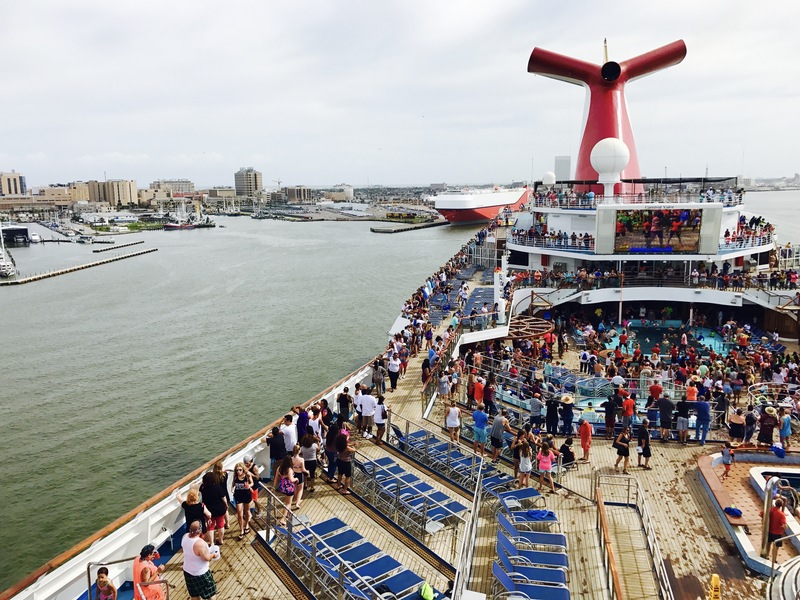 In addition to all the shows, there are so many other things to do on-board. You can soak in a pool or hot tub, or play video games in the arcade or try your luck in the casino. You can work on your jump shot in basketball, or try your hand at volleyball on the upper decks. Meghan and I even ventured up top to play mini-golf in high winds, with some hilarious results. From the moment you step on-board, you know that you’re in a different kind of place, one in which the normal, traditional, and mundane have been replaced by the atypical, unconventional, and quirky. 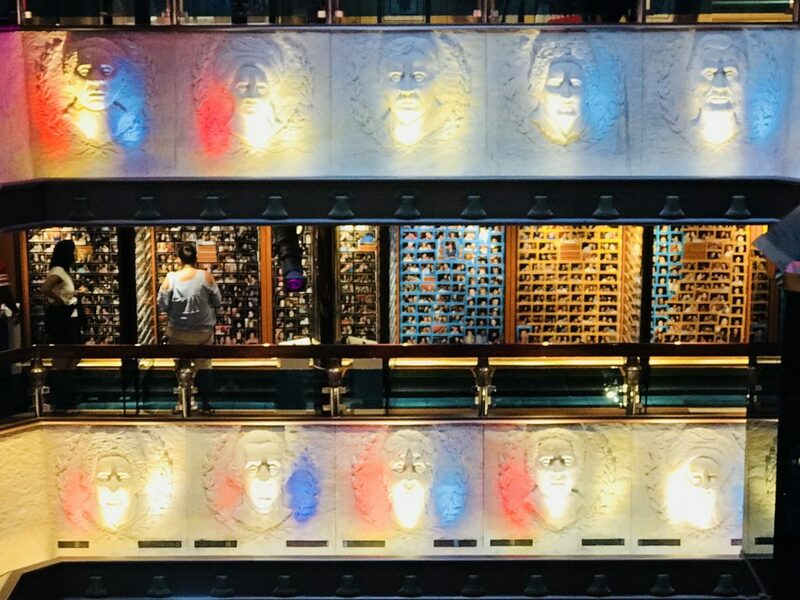 Matching its name, the Carnival Valor’s decor theme is “heroism.” You’ll see tributes to Neil Armstrong on the moon, golden statues of eagles next to the elevators, busts of U.S. presidents, and statues of Greek gods. 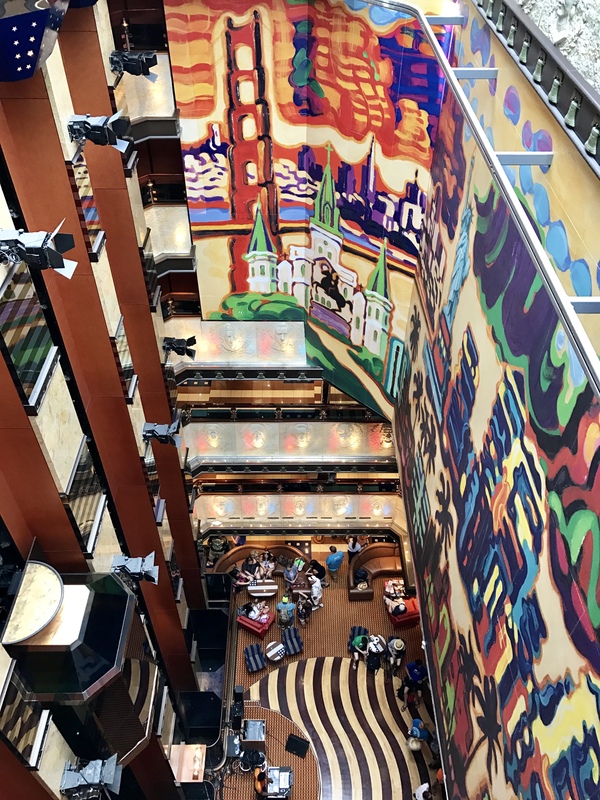 In addition, the ship’s color scheme combines bright greens, reds, and blues with more muted mauve and beige to create a visual panoply quite unlike anything we’d experienced on a cruise ship before. Even the decor has fun, eschewing normal design rules in favor of trying something new. Like this statue with a banana skirt. You’d never see that statue (or the banana skirt) within 100 miles of anything Ann is decorating, but on the ship, this bizzaro combination works in with what the designers wanted to accomplish. It also seemed that cruisers did a little decorating of their own on the ship. We noticed lots of cabin doors that were decorated with signs and pictures. Sure, the decor might not be what you’d put in your house, but isn’t that the point? You’re not at home, you’re on vacation, and the whole idea behind that is to have fun. 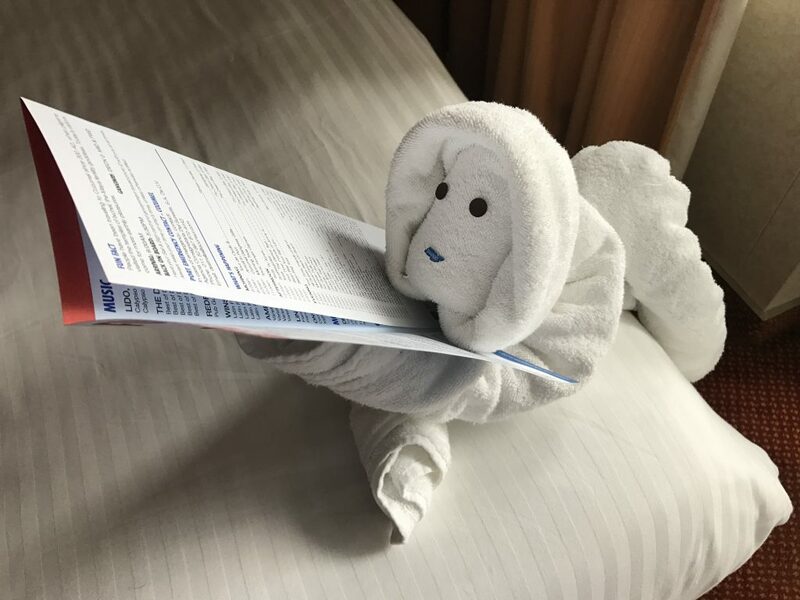 One last little decor detail that added to the fun were folded towel animals we found in our cabin and on the pool deck. We looked forward to being in these areas as we were never sure what we’d see. Whether it was a bear sitting on a counter, or a monkey hanging from the light, we loved being greeted by these fanciful creatures in our cabin, and all around the pool. 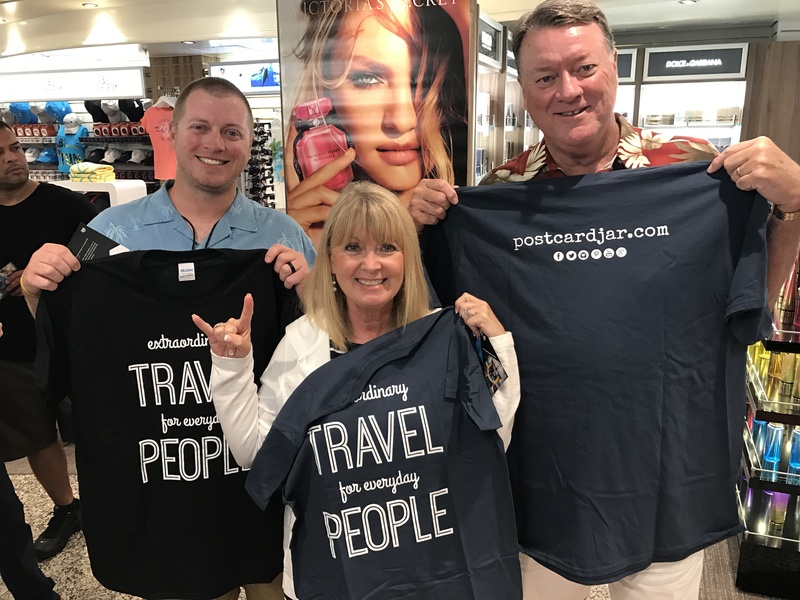 One of our favorite things to do on a ship has always been meeting new people and passengers on our Carnival cruise were some of the most outgoing and friendly people we’ve met at sea. It’s fun to sit, chat and learn about someone else, where they are from, and hear their perspective on the world. You never know, you just might make a life-long friend on the ship. Carnival cruises did seem more open to meeting new people and definitely tried hard to make sure no one was left out of the fun. The crew on Carnival ships were also having a great time. We always enjoy getting to know the room attendants and bartenders on ships and those on Carnival were extremely personable and looked like they were even having fun on at their jobs. 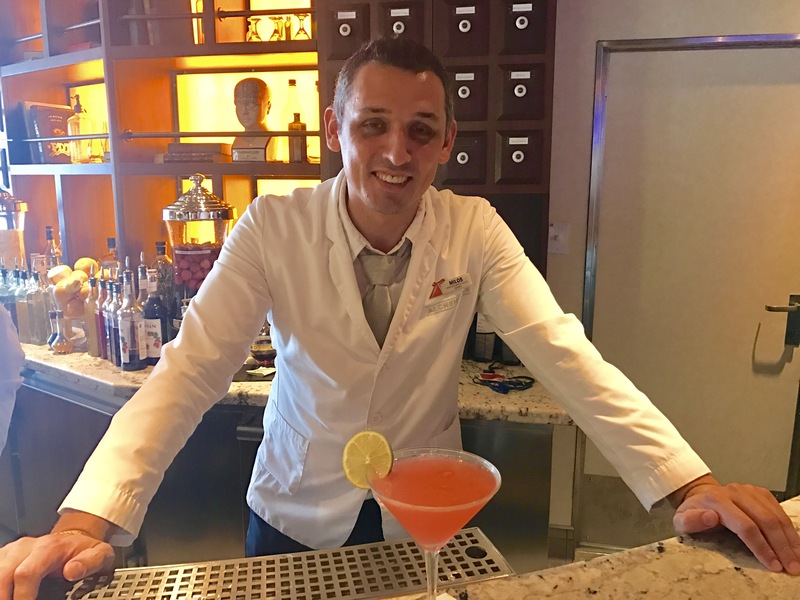 Master mixologist Milos at the Alchemy Bar onboard the Carnival Valor. Our first cruise with Carnival was definitely memorable and when people ask us what we thought of it, we can honestly say it was a lot of FUN! Disclaimer: The opinions expressed in this article are our own. 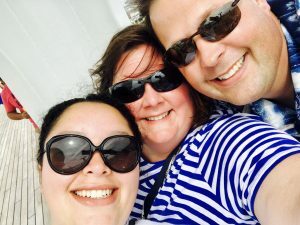 While we paid in full for our cruise fare, excursions, and drink packages, Carnival Cruises did provide us complimentary internet access and priority boarding. 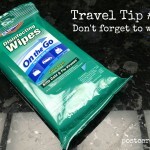 Travel Tip - Don't forget to wipe. How fun! We hope you have a great time. Just let us know if you have any other questions about the ship or cruising. Travel well. Great Article!! We are going on our FIRST Carnival Cruise in a couple of weeks! Our ship is the Carnival Valor too!! SO EXCITED and can’t wait! Thanks for the information about the Cruise!! So excited for you! Let us know if you have any other questions and we’ll be happy to help, if we can. And of course, send us a postcard! That looked like a constant party! How colorful! Does the ship ever feel crowded? The ship is designed to spread people out, and activities are planned in many locations. As a result, it never feels too crowded except for when they want it to, like for the sail-away party on the pool deck on the first day the ship leaves port. Cruising is a great way to go! Now I want a Guy’s Burger and want to board a cruise ship tomorrow!